I love volcanoes. The power, the raw energy, the scale: the reason I came to the Americas. However, the only Reasoning with Volcanoes I did during the first weeks of 2016 was waving to the distant, snow-covered Nevado del Ruiz from the streets of Manizales. I’m happy to say that I have now returned to my passion. 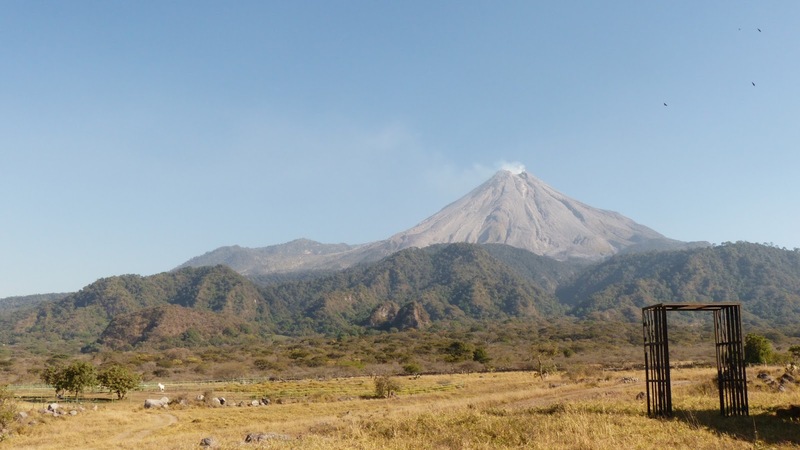 Since February 10th, I have been living in Colima, Mexico, where I am working as a volunteer at Colima Exchange and Research in Volcanology (CIIV). It’s a volunteer position like no other: singularly hands-on and do-it-yourself. CIIV functions simultaneously as a monitoring institute and publication mill and centre for academic research, and since 2004 has been run by Dr. Nick Varley with the aid of students that come from all corners of the planet wishing to get their hands dirty working on one of the currently most active volcanoes in the world. I’m very proud to be a small part of the huge team of volunteers who have worked here; as you can see, we are quite a crowd! (Here). 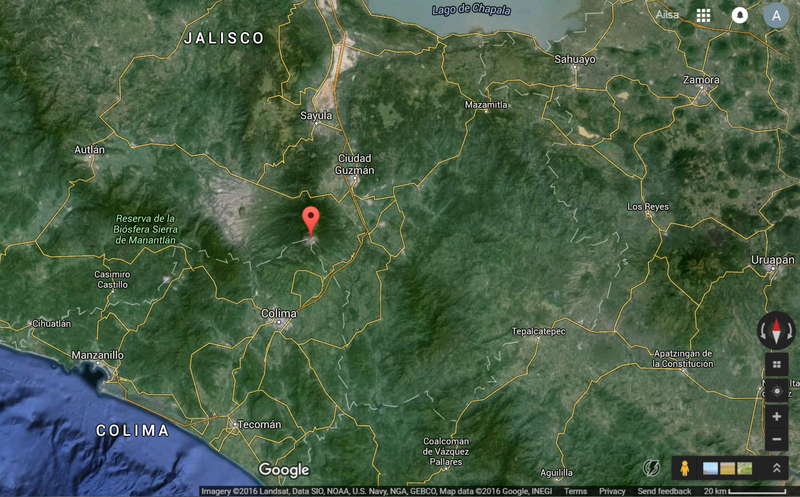 Location of Volcan de Colima, Colima: find it on Google Maps here. My first two weeks here (11 – 25th February) were as unconventional as I could hope for! I spent four days in the field, which included sleeping in sub-zero at 3000 metres, carrying camera equipment up a cinder cone, and familiarising myself with software. Work while back home in Colima was interesting, too: my days were split between getting to grips with software and office equipment, and preparing for Skype interviews. You know it’s going to be a great placement when your first two weeks rival your recent travels in terms of adventure. February 10: The bus from Ciudad de México reaches Colima at seven o’clock. After experiencing the cold winds and grey skies of a wintry capital, I am overwhelmed by the colours and the warmth of Colima. My flatmates aren’t awake yet, so I doze over a coffee in the bus terminal until they are up, and then catch a taxi to my new address. Once inside, I say hello to everybody, find my new room, and promise myself an hour’s kip. Wake up at four. February 11: My first day in the office! CIIV is located in the Facultad de Ciencias (Faculty of Sciences) that belongs to the University of Colima. I spend my first few hours looking through the welcome pack, which instructs new volunteers. I marvel that every task that could possibly be conceived of is apparently already being taken care of by my co-workers; this illusion is dispelled by about my third day. My friends and I work hard, but there is simply more data that can be processed in the time that we have available, especially with the demands of regular fieldwork. As I step out at lunch, the heat of the city rises from the pavement to meet me. It’s a blessing after the air-conditioning of the office. What’s the saying? If you can’t stand the heat, get out of the laboratory. February 12: It’s my second day at CIIV, and already I am in the field. We are monitoring the volcano from the shadow of a barn house in La Joya, a hacienda 8km south of the summit. We have a variety of monitoring equipment that we use to capture data from the volcano: FlySpec, which measures output of sulphur dioxide from degassing at the summit crater; a thermal camera, which captures the temperature of crater-rim fumaroles and explosions; a video camera, for visual evidence of eruptions; and a Nikon camera which we use to photograph eruptions. The volcano really is quite incredible. Volcán de Colima, or Volcán de Fuego, stands proudly at a height of 3839m on the border between the states of Jalisco and Colima. The caldera in which the cone sits contains massive debris avalanche deposits and flows from prehistoric eruptions, while the central cone is composed of andesitic lava flows. Inside the summit crater a transient dome can sometimes be found; during periods of greater activity, such as July of last year, the dome is cannibalised by the forces rising inside the edifice, and enormous eruptions jet large volumes of ash and gas into the air (as an eruption column), or force them as flows down the volcano’s flanks (as pyroclastic flows). Back to the morning of the 12th. We arrive at our monitoring spot (La Joya) at ten o’clock and the volcano is already smoking – a terrible habit. It sporadically stops degassing until three o’clock, when a pale grey plume appears in the crater. It rapidly expands in size, ballooning upwards until the plume resembles a mushroom cloud. After only two short minutes, the emissions seem to have decreased and the wind begins to disperse the plume towards the west. Nevertheless, I am elated: this is the first Vulcanian eruption that I have ever seen! Fuego de Colima from La Joya, with debris avalanche deposits in middle foreground. February 20: After a week of interviews, I am able to return to the field. A team from the University of South Florida (USF) are visiting, so I accompany them with Nick to San Antonio, a barranco in the southern part of the caldera. While Nick and I take pH and conductivity measurements of the thermal springs, the USF team walk upstream to attempt to pinpoint the contact between older deposits and the deposits from the July 2015 pyroclastic flows. I am awed by the barranco’s size: these canyons are BIG. 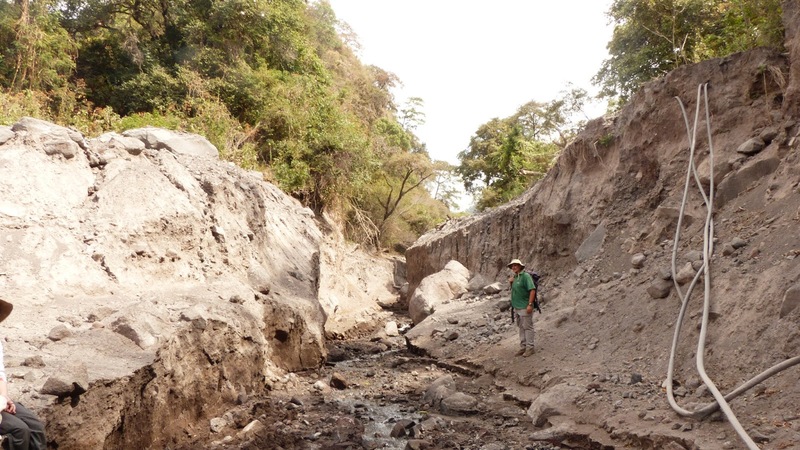 Nick in the lower part of the San Antonio barranco. February 21: The BBC are here! I am extremely excited to meet the team, who are a welcome reminder of home. They are here to film the volcano, of course, and they are lovely, very enthusiastic about this opportunity. 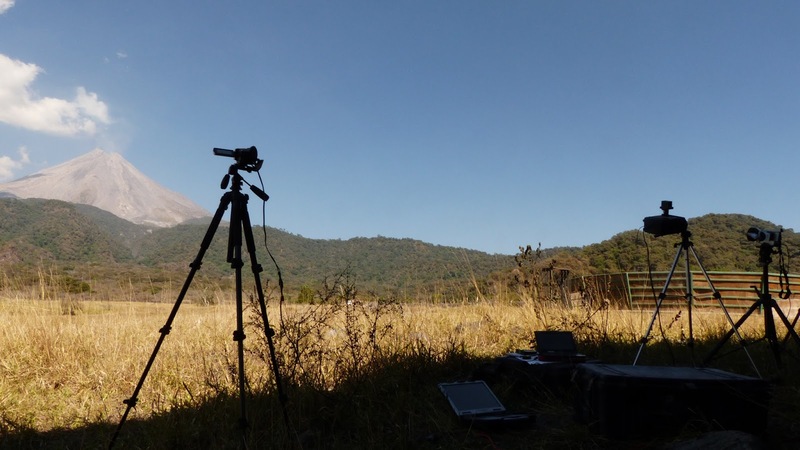 We manage to combine our scientific and creative ambitions: a trip up to Volcancito (a series of parasitic lava domes on Fuego’s north-east flank) allows us to collect both footage and samples from an ash bucket. The hike is breathtaking: I am carrying 15 kg of camera equipment on my back. I have to regularly regain my energy by ‘stopping to smell the roses’, which consists of sitting on a rock and admiring the beautiful south face of Nevado. I feel incredible. There’s nothing quite like prevailing up a volcano, laden with equipment, to make you feel big – and then standing on the shoulder of said volcano to make you feel small. It’s five o’clock in the afternoon, and Fuego begins to stir. At this short distance, the hiss emitted by the degassing plume sounds like a beast lying within the volcano, growling contentedly. And as the sun begins to set, the plume of vapour released begins to grow; slowly at first, curling up and out, and then the rising vapour hits the sunlight’s path and glows orange against the sky. Filming via drone on top of Volcancito, with a gently degassing Fuego at right. The CIIV team leaves the Beeb to film, and we begin our hike down Volcancito in the dark. 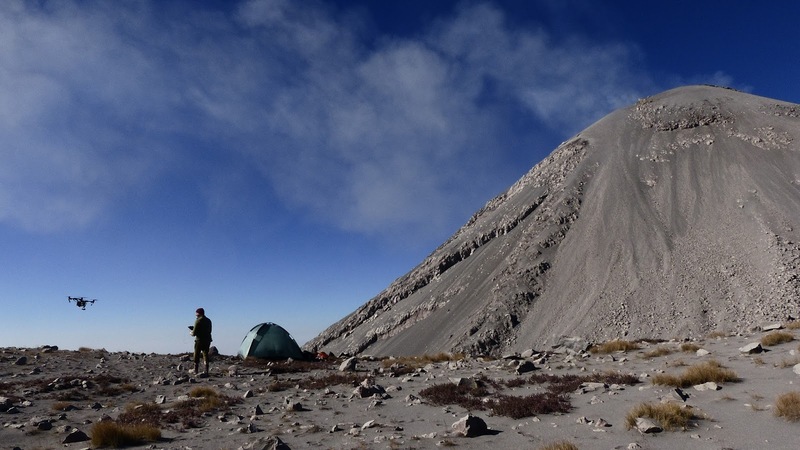 We’ll be camping tonight in el Playon, the shoulder saddle between the volcano and Nevado. At 3000m altitude, it’s chilly, and before sleeping we huddle around a small bonfire for warmth. Looking north towards Nevado, and up at the stars, I can almost forget that there’s an active volcano behind us – almost. At half past ten an eruption begins, and a feather of white vapour at the summit sprawls into a blossoming white cloud. Since tonight is clear with a waxing gibbous moon, the effect is spectacular. The white plume rising in the black sky, the stars, the cold: Colima blows my tiny mind. February 22: el Playon is a convenient stop on the way to the refugio at the top of Nevado. 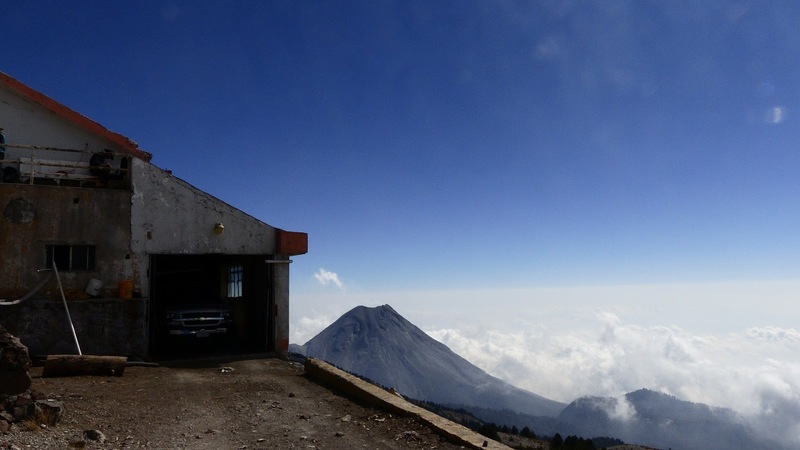 This small building is staffed by the Protección Civil de Jalisco (Civil Protection of Jalisco State), and boasts incredible views of the summit of the volcano, so that we can take excellent FlySpec and thermal data of the northern flanks and crater. The PCJ staff work shifts, and arrive in a truck emblazoned with ‘BOMBEROS’ (‘FIREMEN’), which we find very amusing: are they planning to put out the eruption of Colima with a hose? However, they do a good job, and ironically do an excellent job of building fires, in the large stove in the kitchen. The CIIV collect thermal data overnight, which involves operating the equipment during long shifts in the freezing cold, so a fire is really welcome. Unfortunately I won’t be part of the team this time: I have to return to Colima city, and prepare for another interview. I can’t wait for my chance to stay at Nevado overnight – ¡tengo que volver! I do hope to return to Nevado soon. In the meantime, I’ll keep my fingers crossed for more unconventionality in the coming weeks! *Please note! I’m still learning to hit the right tone of this blog, and may vacillate between descriptive prose, informative travel talk, and precise scientific jargon. I understand that sometimes things can get muddled, and that my descriptions of volcanoes can be overly florid: I suggest you take them with a Pichincha of salt.